This website, its text and photographs are © 2009 - 2019 Al Frazza. All rights reserved. "I have seldom felt a pain so acute as that of communicating to you the news from America, which personally regards yourself. I am afraid my authority is too good. Your Son has met a Soldier's fate. "Experienced in calamity, describes what it is to resign an object near the heart, and ho[w] poor our best fortitude is upon such trial I am unfit to comfort or exhort you. Time and reflection can alone relieve you: I wish therefore only add to the tears of the Corps. My private lamentations for the Son of an invaluable parent and the assurance of the respect I have bear to his memory." 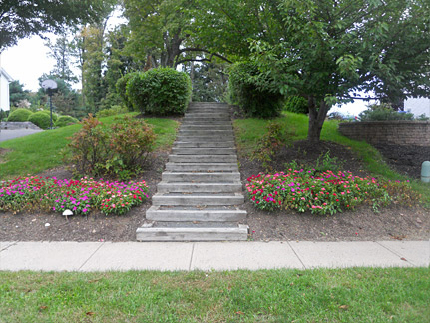 The Memorial is at the end of a walking path that begins with steps on Gearys Ridge Rd. Please note that the Coronet Geary Memorial is located among a residential area. The walking trail is next to the private property of the neighbors. Please stick to the walking trail, and respect the privacy and property of the neighbors. 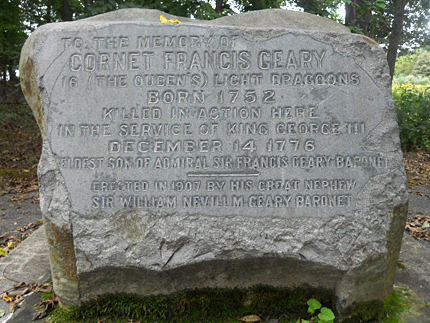 "To The Memory of Cornet Francis Geary. 16 (The Queen's) Light Dragoons. Born 1752. Killed in action here in the service of King George III December 14, 1776. Eldest son of Admiral Sir Francis Geary Baronet. Erected in 1907 by his great nephew Sir William Nevill M. Geary Baronet." "Support for the rebellion against British tyranny was at a low ebb in December 1776. The British occupied a strategic area in New Jersey and Washington's army had retreated across the Delaware River. 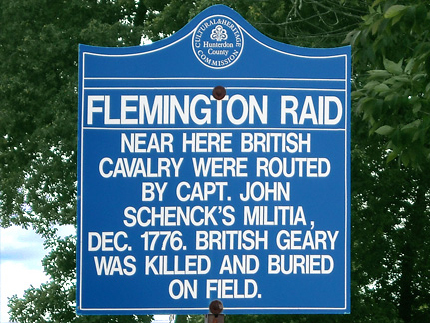 "The British commander in New Jersey sent Cornet Geary and a squad of Dragoons to conduct a raid on Flemington to destroy colonial supplies and to see if a determined patriot resistance existed. This force departed the main body at Pennington on December 14, 1776 and conducted the raid, but upon returning they were intercepted by the Amwell Militia. "Determined to repulse this intrusion, Capt. John Schenck had gathered the citizen soldiers. 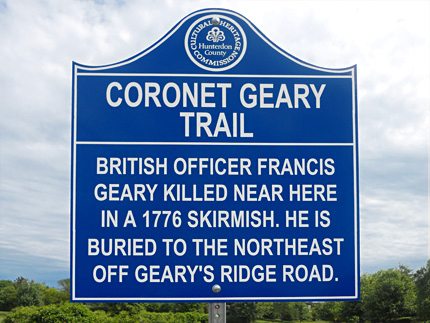 During the fierce fire fight that ensured, Geary was shot dead. The other Dragoons fled in disorder. Geary was buried nearby. This stone was erected by the Geary Family when the gravesite was confirmed in 1891. 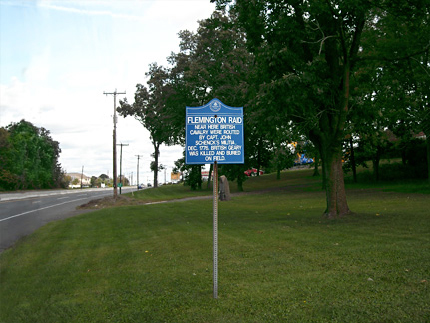 "The action contributed to Gen. Washington's ability to conceal Durham Boats at Bulls Island and to maintain the Old York Road supply line." 1. 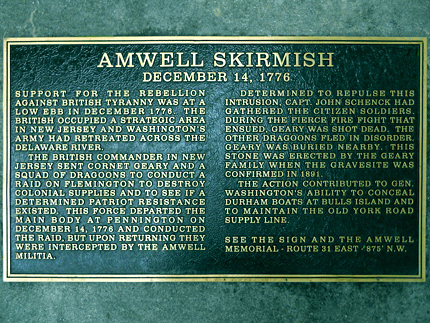 ^ Information about the raid drawn from the markers at the site: a Hunterdon County Cultural & Heritage Commission sign, and the text of the Amwell Monument which was dedicated by the Raritan Township committee and the Bicentennial Committee on December 14, 1976. 2. ^ Burgoyne quote was cited in the article "The ambush of Geary's Dragoons. From Fact to Fantasy The British 16th Light Dragoons and the Raid on Flemington, New Jersey, December 14, 1776" by Gilbert Riddle that originally appeared in, vol. xx111 no. 4 Autumn 1992, page 18-26 of Brigade Dispatch, a publication of the Brigade of the American Revolution. Gen. John Burgoyne to Adm. Geary, February 26, 1777. Elias Vosseler Papers, Hunterdon County Historical Society, Folder #315. Copied from the original by Sir William Nevill Geary, Bt., Oxon Heath, Tonbridge, England. Mr. Riddle's article is recommended for those looking for a more detailed account of the Flemington Raid and its aftermath. It is available to be read online here. 3. 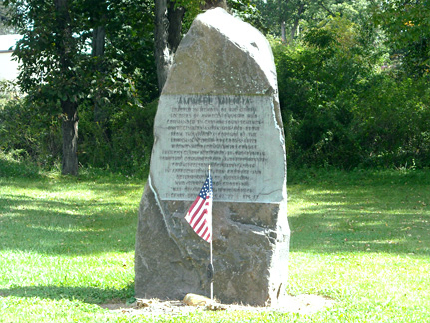 ^ Monument dedicated by the Raritan Township committee and the Bicentennial Committee on December 14, 1976. 4. 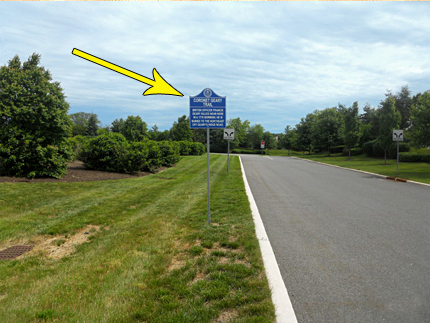 ^ Hunterdon County Cultural & Heritage Comission sign. 5. ^ Text of the Cornet Geary Memorial - Erected in 1907 by his great nephew, Sir William Nevill M. Geary, Baronet. 6. 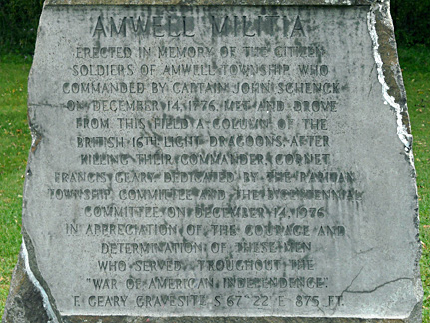 ^ Text of the Amwell Skirmish marker at the base of the Cornet Geary Memorial. 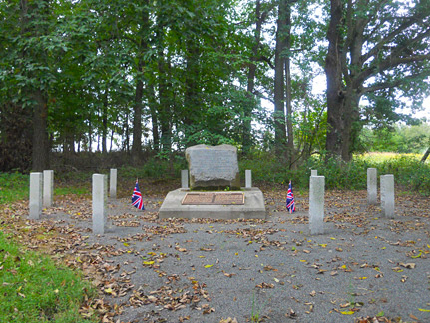 The ultimate field guide to New Jersey's Revolutionary War historic sites!